If you’re looking for a spec-heavy high-end mountain bike for fun and adventure, you can’t go wrong with the Cannondale Habit. Offering speed and agility, this lightweight and stiff-forked bike is a thrill seeking mountaineer’s best friend. With the kind of traction and suspension this bike offers, you’ll be hooked from the first ride. 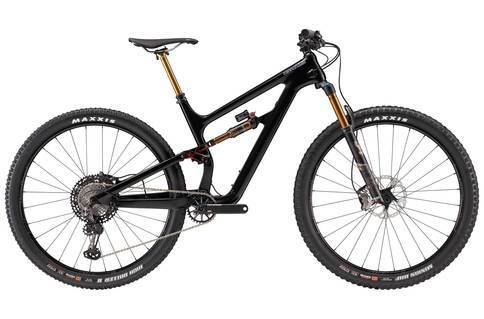 The Cannondale Habit is one trail bike that delivers on performance and entertainment. We jumped at the chance to review this pro bike with its outstanding specs and aggressive geometry. Cannondale has been in the business since the 70s, so they’ve had some time to master the art of creating cutting-edge mountain bike models. This is probably why we were totally in love with this full suspension trail bike. The suspension on this bike really delivered, with the zero-pivot seat stays offering excellent responsiveness. We took this bike through some really rough terrain and were able to maintain control and speed pretty well throughout the test run. Sitting on the lighter end of the weight spectrum for a mountain bike, the Cannondale Habit and its unorthodox one-legged Lefty fork is perfect for those daredevil moves. This bike is a nice middle ground for cross country and trail mountain bikes really, taking climbs like a pro, fast and easy. A fun and capable mountain bike for the non-racer, one of the best on those technical climbs! We just loved getting to review the Cannondale Habit because it was simply so much fun to test its limits. So far, we found none! It’s stiff and precise, and helps you navigate those perilous trails with ease. You can get high-end or mid-range priced models.